Ownership / Access: Finnish National Board of Antiquities and Finnish Ministry of the Environment. Notes: Karnakoski Fortress is a bastion fortress in Finland located in Karnakoski, Savitaipale built by Russia between 1791 and 1793 to protect Saint Petersburg.Today Karnakoski fortress is a tourist attraction, although there are no guided tours or other tourist or travel services in the fortress, simply guidance signs. 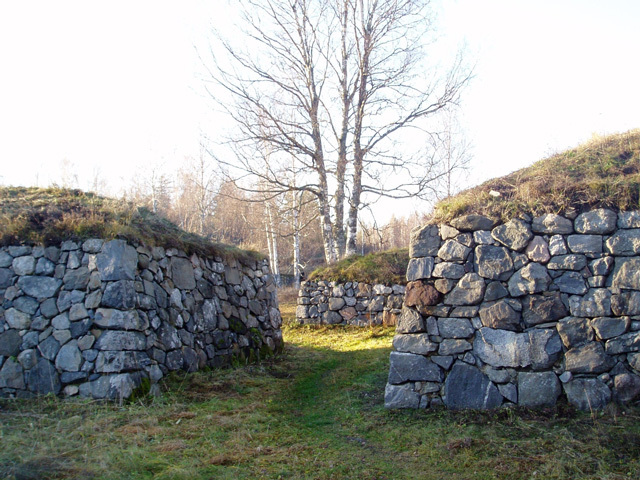 Finnish National Board of Antiquities and Finnish Ministry of the Environment have listed the fortress area as nationally significant cultural historic landmark. Finnish National Board of Antiquities has restored Karnakoski fortress to its former shape together with other fortresses in south-eastern Finland. Walls were repaired and the fortress area was restored and cleared. The work was finished in 1997. An inventory of the vegetation in the fortress area was conducted in 1987, based on which work began to maintain an old meadow biotope vegetation in the area. The area was reaped and cleared of young trees. Currently sheep are allowed to graze in the area during summer to maintain a traditional pasture in order to provide a suitable habitat for organisms that have become vulnerable after traditional agriculture began to modernize. Other historical buildings nearby are an old barge harbor, mill and saw built in the 1830s and a double-arch stone bridge from 1886. The mill has not been used since the 1950s, but was restored by a local village organization in 2002.